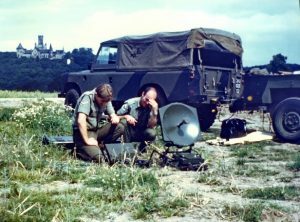 Using a 2W TWTA power source and powered from integral batteries, it was capable of providing up to 4 hours of full duplex, low speed data or analogue, pulse width modulation voice communications. 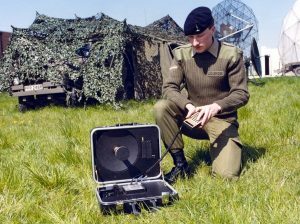 A second Manpack SGT was completed in-house after the move to Defford and used a solid state 2W power amplifier. Both of these prototypes were fixed frequency. The model shown here was produced under a research contract with Ferranti Electronics at Poynton and was tuneable over the full 500MHz SHF receive and transmit frequency bands. It used the same prototype speech and data modem as the in-house prototypes. 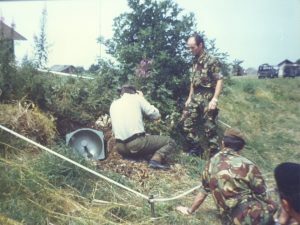 This unit was used extensively by 30 Signals Regiment personnel on trials in Berlin, West Germany, Cyprus, Norway, Saudi Arabia, Belize and elsewhere. Various configurations of data terminal were used ranging from robust, QWERTY terminals to compact handheld devices. A crypto was also developed by CESG to provide compatibility with existing, in-service hardware. Two further Manpack SGTs were developed under R&D funding. These principally addressed ergonomic and weight reduction targets. As part of the latter effort, the modem was rebuilt, still to the original Charlie Jones design, into a number of thick-fi|m, hybrid electronic packages by the Microelectronics Unit at RSRE. 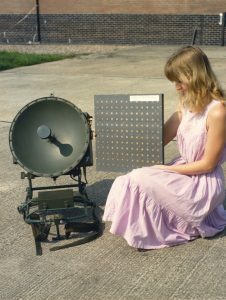 Terminals to this design, known as the UK PSC 5O5, were procured by MoD in small numbers for specialist use. They incorporated the RSRE hybrid modem which was sold to Ferranti as part of the procurement process. The RSRE prototypes became a test bed for further development. 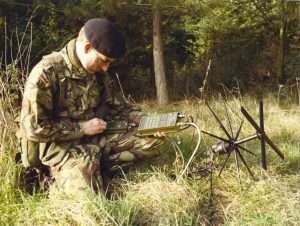 Operating within appropriate satellite antenna footprints, the link budget allowed 16kb* speech between a Manpack SGT and a large ground station. Shown here is a ‘piggy-back’ 16kb*modem. 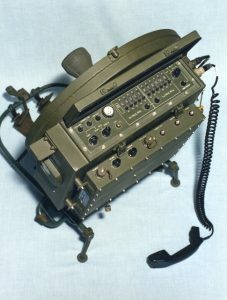 Functionality such as this later became part of the modular UK PSC 5O4 SGT. 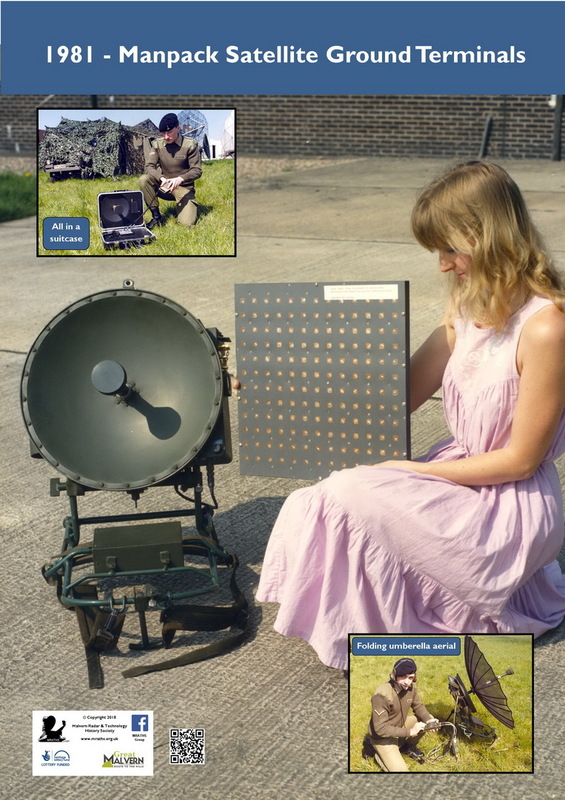 The folding, metallised mesh antenna shown here enabled a 6dB increase in gain over the rigid 460mm diameter dish with a corresponding increase in battery lib from the Manpack and reduction in satellite EIRP. When not in use, the umbrella-like antenna folded and was stowed in a 180mm diameter tube. The potential for a flat, circularly polarised array antenna was investigated under a contract with Thom-EMl at Wells. 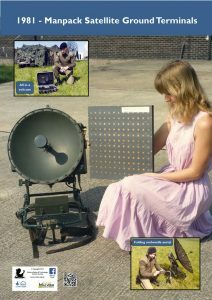 Whilst it was never likely to be cost competitive with the splash-plate fed dish antenna, it did offer the potential for a more compact Manpack design and provide some null-steering capability to mitigate local jamming or interference. A low-loss feed design afforded a similar efficiency to the dish antenna. A smaller array was also built for the Satcase, shown in the next picture. The objective of the Satcase development was to demonstrate just how compact an SHF terminal could be, given the technology of the mid-1980s. Bulky microwave filters and the diplexer were eliminated through adopting half-duplex operation and a monolithic microwave integrated circuit (MMIC) low noise amplifier, developed by RSRE in conjunction with Plessey Caswell, replaced the discrete component device used in the Manpack. Communication was just low-rate data within a satellite spot beam: no voice comms. 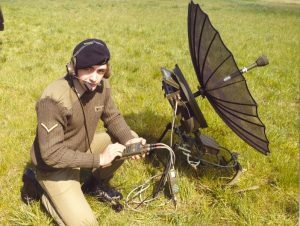 Dropping in frequency to the UHF band is good news for mobile SGT developers aiming to minimise size and weight of equipment in the field but it is expensive in terms of satellite resources and renders the user more vulnerable to local detection. There are however occasions when that trade off is weighted in favour of minimum size. The terminal shown here, designated UST-I, followed in-house prototypes built at Defiord by Steve Perkins. The demodulator and lF stages were implemented in thick-film hybrid technology by the RSRE Microelectronics Unit. The contractor for UST-1 was Ferranti, Poynton. The terminal used a commercial, off-the shelf UHF antenna and a data terminal developed under the SHF Manpack programme. Other commercial data input devices, such as the Psion XP, were based on end user preferences.